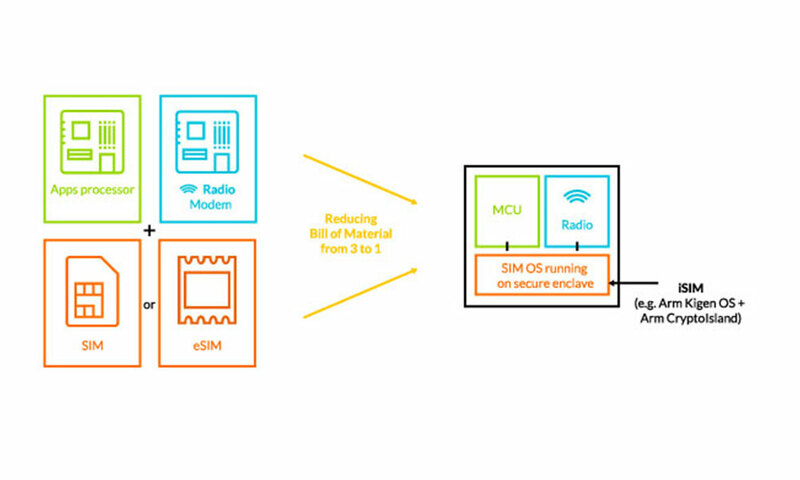 ARM has announced a new integrated SIM technology, or iSIM, technology that directly embeds the SIM data directly into a processor. This works as part of the company’s efforts to cater to more connected devices, as it expects there to be as many as 4.4 billion such machines in the world by 2025. The new standard is compliant with the GSMA Embedded SIM standard as the SIM holds important data about the subscribers provided by the telcos. Additionally the iSIM lives in a secure partition in the ARM core itself, alongside the ARM Kigen OS and ARM CryptoIsland security solution. The iSIM is viewed as something more efficient than the eSIM, since it doesn’t require a separate chip on the motherboard. Essentially reducing cost for manufacturers. This also simplifies deployment for IoT devices as thanks to the new design, everything is addressable via a single unified chip (combining a microcontroller, radio and the iSIM) rather going through different components for IoT applications. Apple has been trying to push the eSIM technology with little success at this point. Being able to switch between network providers without the need to physically handle a new SIM card is not something that people think about much. Especially since consumers rarely change network providers. However, the technology is being seen as something that might be more useful for enterprise users. Who will be able to switch entire fleets of company owned smartphones to new networks with a flip of a switch.